There are a lot of great attractions to check out in Pigeon Forge. You want to find one that is affordable and fun for the whole family. Among these attractions there are a few that stand out as quite unique. On your next vacation try these Pigeon Forge attractions you have to see to believe. Driving down Pigeon Forge Parkway you might’ve come across a house that is literally upside down. That upside down house is WonderWorks. This attraction has been named an amusement park for your mind. With over 100 hands-on exhibits to explore, WonderWorks is a great place for the whole family to expand their imagination and learn something new. You’ll see cool exhibits related to space, natural disasters, and the human body. It’s definitely one of those Pigeon Forge attractions you have to experience for yourself. Have you ever met a celebrity before? At Hollywood Wax Museum you’ll get to meet tons of celebrities…even if they are made of wax! This two-story museum features both current and classic movie and TV celebrities. You can pose next to celebrities like Elvis, Johnny Cash, and even Marilyn Monroe. But it isn’t just about posing for pictures. You can also learn about each celebrity’s pet peeves and their accomplishments. After you’re done looking around the museum, don’t forget to stop by the studio gift shop for celebrity souvenirs and memorabilia. Watch hundreds of beautiful tropical birds fly around perfectly landscaped gardens at Parrot Mountain & Gardens. You’ll be amazed at the large variety of birds, flowers, and landscapes you’ll get to see within 4 acres of land. This attraction appeals to visitors of all ages. Guests love the tranquil atmosphere and getting to interact with the birds. You’ll get to see different bird species like toucans, macaws, cockatoos, and parrots. This is a great place to take family photos as well. You can either roam through the gardens at your own pace or go on a guided tour. Either way, you’ll get to relax and take in all the beautiful colors around you. 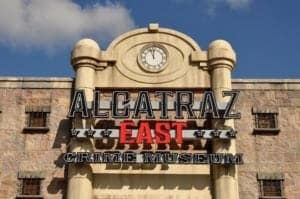 Five different galleries at the Alcatraz East Crime Museum take you deep into the mind of a criminal, forensic science, and crime prevention. It’s the perfect museum for those of you that love crime shows like Law & Order or Criminal Minds. Guests love reading about American history shown from a different kind of perspective. This crime museum has 2 floors of interesting material to look at with over 100 interactive components. If you’ve already been to the museum, don’t worry because they have temporary exhibits so each time you can see something new. Interested in checking out these amazing Pigeon Forge attractions? Browse our Pigeon Forge cabin rentals to find the best fit for your family. We look forward to seeing you soon! Why is Staying in a Pigeon Forge Cabin Better Than a Hotel?